Are you planning an elegant wedding? Then let the beautiful Austin Princess Limousine inspire you. This 1964 luxury limousine is finished in White with a tan leather and burr walnut trim interior. It was coachbuilt by Vanden Plas and was originally used by the Lord Mayor of Liverpool before being kept in a private collection for many years. It can comfortably seat 6 passengers so is an ideal choice for the bridesmaids or for the bride with a very large dress. Dressed with car ribbons and supplied with car flowers and champagne. 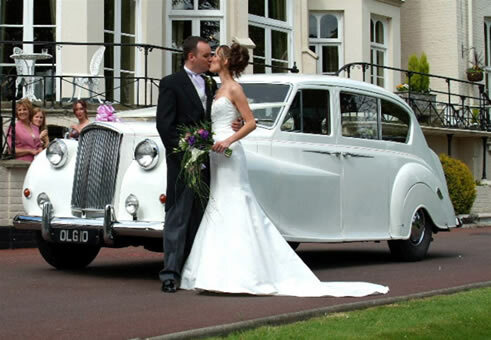 Let Special Day Cars attend your every need. Ideal as a second car with the Rolls Royce Open Tourer or as a pair with the black and white Princess, it can seat 6/7 passengers. A special wedding day requires a very special wedding car.